The Book of Durrow, one of the earliest surviving decorated Gospel books in Western Europe, will go on loan to the British Library for a landmark international exhibition of early medieval manuscripts and other objects, which opens in October 2018. The British Library exhibition ‘Anglo-Saxon Kingdoms: Art, Word, War’ will explore the riches of art, culture and ideas covering the six centuries of the Anglo-Saxon period up to the Norman Conquest. The Book of Durrow’s decoration contains parallels with Anglo-Saxon metalwork and is thought to have been made in Durrow, Co. Offaly. The Library worked closely with the British Library, and have also engaged with the Durrow community in County Offaly. Media coverage can be seen from the Irish Times, RTÉ website and video from RTÉ News. The Book of Durrow is one of the most significant manuscripts in Ireland and Trinity lends it only very rarely. The British Library exhibition is an internationally significant, once-in-a-generation opportunity to see the most important European manuscripts together, along with contemporary metalwork – for example, from the Staffordshire Hoard. The exhibition has been several years in the planning, and opens on 19 October 2018, running until 19 February 2019. 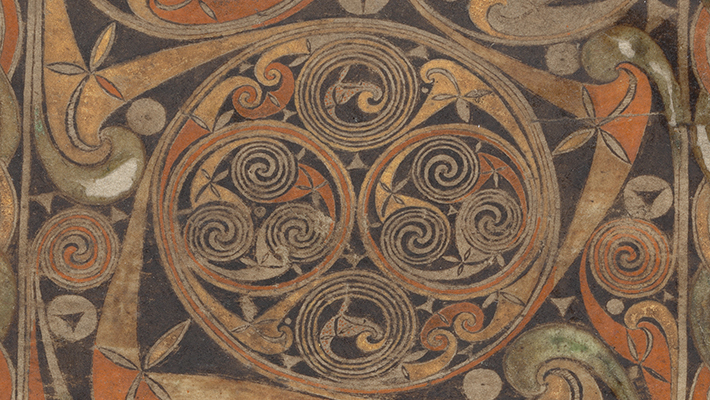 Trinity is delighted that to have completed the digitisation of the Book of Durrow and created an online exhibition that will feature on Google Arts and Culture from late September. For the opening, there will be a new Thames and Hudson volume on the Book of Durrow, in the same series as the recently published Book of Kells volume.